Pub in Wanstead. 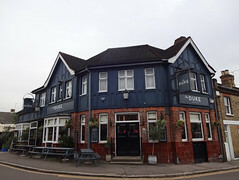 It was previously known as the Duke of Edinburgh photo but was renamed after a change of management in late 2013. We haven't visited since the change of management (except on a day when they turned out not to be open), so some or all of the below may be out of date. It has at least one dart board. There's a beer garden of some kind (possibly just a patio), and some picnic benches out the front too. bob visited on a Wednesday afternoon in May 2011. There were two other customers when I got there around 3pm, and a few more turned up when I was there. Everyone except me seemed to be a regular. The TV was showing a Judy Garland biopic with the sound on quite loud. There were three real ales available: Young's Bitter (£3.20/pint), Old Speckled Hen, and Courage Best. The Young's was fresh on; I had the first pint out of a new barrel, and the member of staff on duty was careful to make sure that I was happy with it. Not sure if they do hot meals, but there were rolls available while I was there (ham roll £1.50, bacon roll £1.75). There's a pub quiz on Thursdays, according to a notice seen in May 2011. An anonymous commenter informs us that the management changed in mid-2010 (Rita was replaced by Lyn), and also that the pub has wifi, though bob couldn't find a wireless network in May 2011. Accessibility: Steps to get in. Level access to bar, seating area, and toilets once you're in (not sure about beer garden). Last visited by bob, May 2011. Opening hours taken from the Duke website, January 2019. Last edited 2019-01-13 10:17:54 (version 18; diff). List all versions. Page last edited 2019-01-13 10:17:54 (version 18).